Last month, I shared my excitement about attending my high school class reunion for the first time. I had a blast!! Did I say I had fun? It was a group reunion for recent graduates of 2012, who were celebrating their first five year reunion, all the way back to 1972, and I fit right in there. Of course, the 2012 graduates had the most attendees, but Class of ’77 had the most fun. It's amazing what people remember about you from high school. For example, former Student Council President Mary Winkelmann (In the blue dress), remembered I showed her how to dance the hustle during our lunch periods. The hustle? Wow, I couldn't remember the dance moves, so I have to rely on YouTube. Do you know how many versions there are?? Besides enjoying tasty hot hors d'oeuvres, the music videos that highlighted 40 years brought back memories. --loved it, but the photo booth was the best. The props are always fun, so I grabbed the phone, considering I stayed on it enough during high school. 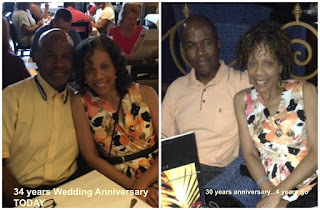 A few days later, I celebrated another wedding anniversary with Kerry. I found it interesting that I could still fit the dress I wore four years earlier. Here are Kerry and me at dinner. What's amusing about this picture is the coordinated yawns in the background. What an amusing photo bomb. I hope you're enjoying your some too. Believe it or not, I've been writing like crazy. I'll share those new releases with you next month. It's been a long time since I've attended a high school reunion. I'm so glad you had a good time at yours! I went to my 50th last year. I couldn't believe how well some people had aged. I hope there will be more at my 50th. Sounds like you had a great time, Pat. I went to my sister's high school reunion last year. Very fun. I'm a people-person, so I had a lot of fun.